Here at Setmore we operate with a very simple formula. The more ways your customers have to book their appointments online, the more appointments you’ll likely get overall. And, the less time you’ll spend on the phone, helping customers book their appointments. If you’re new to Setmore or online booking, it’s much simpler than it looks from the outside. Setmore gives you the tools to establish your online presence and open the digital front door that customers will use to engage with your business. Here’s a list of the apps we’ll be using. You don’t have to use them all, but the more you use, the more powerful your combined online software solution will be. Scroll down for an in-depth breakdown of each app’s role and how to use it. This is where the rubber meets the road. The Booking Page comes free with your Setmore account. It lists your staff, services, availability, and contact info. Customers book their appointments here, and their appointments show up on your Setmore calendar. Your primary goal is to get customers to your Booking Page. First, let’s add some key information to your Booking Page. Go to Apps & Integrations, then look under the section titled “Your Booking Page.” Here you can access or edit your Booking Page URL, visit your page, or configure the back-end options by clicking the “Configure…” button. The important thing to remember when setting up your Booking Page is to make it welcoming and inviting. Do this by providing verbal descriptions for each of your staff members and the services they provide. It’s also important to upload a thumbnail avatar for each staff and service. Step 1: Add your business details by navigating to Apps & Integrations > Your Booking Page (Configure) > Company Details. Step 2: Add your staff member profiles under Settings > Staff. Step 3: Add your service offerings under Settings > Services. All the information you fill in through your Setmore interface will show up on your Booking Page. When you’re all finished, be sure to check it out by going to Apps & Integrations, and under where it says “Your Booking Page,” click “Visit Your Page.” More information means your customers can make a better informed decision about what services to book, which means a better experience overall. 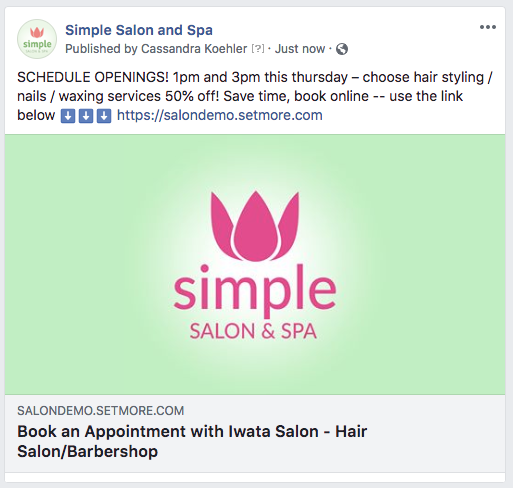 Using Facebook’s “Add a Button” feature, you can create a call-to-action button that will link directly to your Setmore Booking Page. This button will appear to your followers and fans who are browsing Facebook from a laptop, or from their phones. Step 1: To get started, go to your Facebook business profile and tap the “Add a Button” button, right below your header image. Step 3: Enter your Booking Page URL and save your button. The “Book Now” button will appear on your Facebook business page. Click it, and then select “test button” to verify that the button works. Adding the button is only half the battle. When using Facebook to promote your services, you should be making regular posts that encourage users to schedule an appointment online. And you should link these posts to your Setmore Booking Page. Instagram is great for posting photos of your work. Recent updates to the platform now allow customers to book appointments directly through the Instagram app. Instagram doesn’t offer exposure to as many customers as Facebook. But the key advantage is being able to use photos of your work to build interest in your services. Customers can see your awesome pics, and then act on their interest to book your services online. They can do this in just a few taps, without leaving the Instagram app. Step 1: From your Instagram business profile, tap Edit Profile and scroll down and tap Contact Options. Step 2: Tap “Add an action button >” then select Setmore from the list of options, and tap Next in the top right corner. Step 3: Enter your Setmore Booking Page URL and tap Done in the top right corner. The “Book” button will appear on your Instagram profile. When customers tap this button, your Booking Page will open inside the Instagram app, giving them a direct path to book online. Like with Facebook, this button becomes more effective the more you promote your services! Post your availability along with a message such as “Tap the Book button in our profile.” And do it regularly to remind your customers that they have this option. Despite all claims to the contrary, email marketing is still very much alive and worthwhile. And, publishing a monthly newsletter with coupons or promotions is a great way to build your base of returning customers. Setmore gives you a way to automatically export new customer contacts to your newsletter recipient list. This saves you the time involved in manually exporting/importing customer contact information from Setmore to MailChimp. But the real benefit here is when you include a link to your Booking Page in your email newsletters. This makes it even easier for customers to book an appointment online. Or, better yet, if you’re promoting a deal or sale in your newsletter, this lets customers act on their interest right away. MailChimp is our email marketing app of choice. And it’s the one we’ll be discussing here. But Setmore also offers an integration with Constant Contact. Step 1: In Setmore, navigate to Apps & Integrations, then scroll down and click on the MailChimp integration card. Click the Activate button in the MailChimp details window. Step 2: Log in with your MailChimp username and password, then authorize access for Setmore. Step 3: Select the mailing list where your Setmore contacts will be exported to. 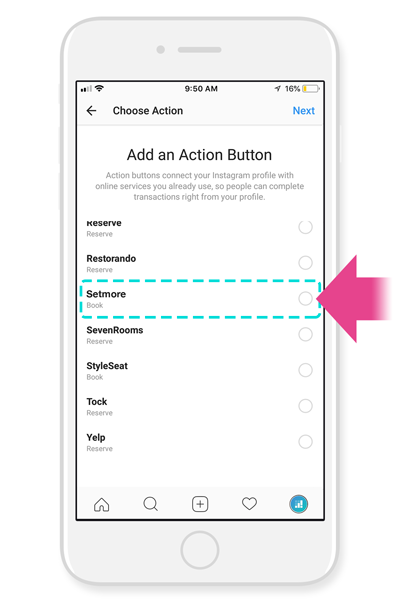 Now whenever you add new customers to your Setmore account, they’ll automatically be exported to your MailChimp email marketing list. Customers may also add themselves simply by booking an appointment through your Booking Page. This also works if customers book from your Facebook or Instagram integrations, mentioned above. Online scheduling is designed to reduce the number of calls you get, but you’ll always have to deal with a few callers. Live Booking is the final piece of the puzzle. This add-on service from Setmore allows you to forward your business calls to a team of remote receptionists. They’ll answer your calls and help customers book appointments directly to your Setmore calendar. Think about it – you’ll never miss another phone call, ever. If a customer calls, a receptionist will always be available to pick up the phone and facilitate the booking. Live Booking is currently available in the US and Canada, but users in the UK or Australia can request a personal invite to the service (send an email to vijay@setmore.com with your request). Step 1: Log into Setmore by going to https://my.setmore.com. In your Setmore account, click the “Products” icon in the left navigation bar and select Live Booking. Step 2: Follow the prompts to sign up for the service. Once your payment is received, you’ll be issued your unique Live Booking phone number. The number is made live instantly. Step 3: Now you can either use the Live Booking number as your business number, or forward your current business number to your Live Booking number. Live Booking is priced to be affordable even for solopreneurs or people who run a 1-person shop. (And it’s a lot more cost-effective than hiring a personal assistant.) Existing Setmore users can sign up for just $1 USD. Customers can book online from your Booking Page, Facebook page, and Instagram profile. Customers who call will speak with a Live Booking receptionist, who will schedule the appointment directly to your Setmore calendar. New customers are automatically exported to your mailing list, so you can send out newsletters and promotions to keep them coming back. Much of this process is automated, which means that you’re freed up to focus on more important things. Like running your business, or delivering a high-quality service, or thinking up new ways to expand your services and reach new customers. Most of the apps and services we covered here are free to use, with paid options to access advanced features. But you could set up everything as described and only pay $1 USD. So what are you waiting for – Get started today! This has been very helpful, thank you! Does this sync up with Intuit? We are happy to help you in any way possible! Setmore empowers thousands of small businesses around the world with smart appointment scheduling solutions. Gain insights about scheduling, business practices and the culture of Setmore right here.